Oh, oh, oh, oh! 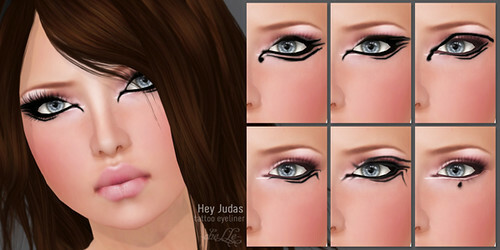 Judas, Judasssssss…..
✿ cheLLe ✿ has just released the Hey Judas tattoo eyeliners, and they are f-i-e-r-c-e! This set includes six eyeliners on the tattoo layer. 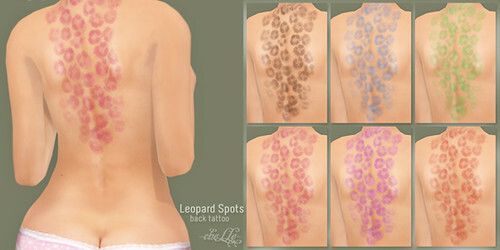 You can wear it over any skin or layer with other existing tattoo makeups. Enjoy! Some of Cajsa’s dearest friends have created a tribute event to honor the memory of Cliff, her RL cat that recently passed away. We’re also having a 3-day sales event with proceeds donated to the Oregon Humane Society. You can read more about the event at Kess’ blog.